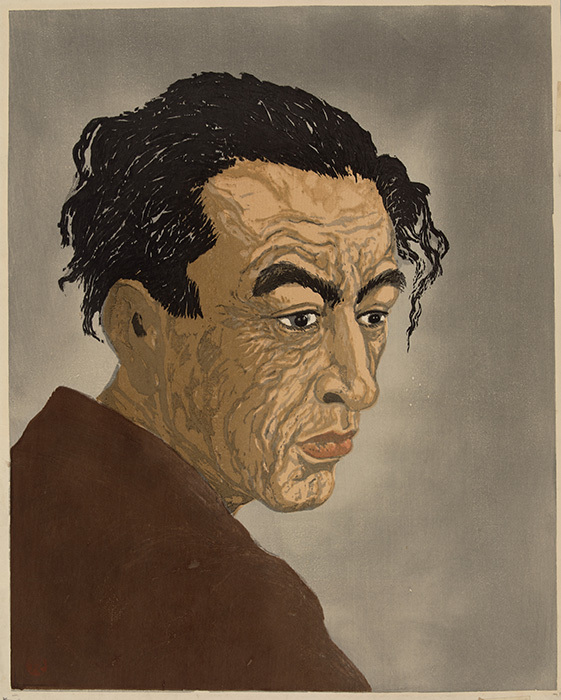 Onchi knew the subject of this widely acclaimed portrait, the poet Hagiwara Sakutaro, both professionally and personally. 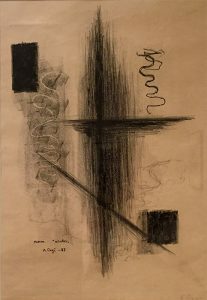 The print was produced in an edition of only two during World War II, when many artists, including Hagiwara, were struggling for survival in pursuit of their art. Onchi’s style is generally abstract with the exception of portraits, which, he argued, “have to be realistic.” Based on a photograph, the work renders deep wrinkles, sagging creases, and disheveled hair. Onchi conveys the despair of Hagiwara’s personal life and the strain of living in wartime Japan with disturbing intensity. During the Occupation of Japan from 1945-1952, when foreign interest in Japanese prints grew rapidly, the portrait rose to fame as one of the symbols of the growing relationship between Japan and the Euro-American world. To meet the demand of Western collectors, the portrait was re-printed by others with Onchi’s permission and was widely displayed in museums outside Japan. Poem “Winter” is representative of Onchi’s progressive, avant-garde approach to printmaking. Deeply influenced by the “new” artistic styles from Europe and the United States that he saw in reproductions, Onchi became well-known for his innovative use of unconventional printing materials such as string, leaves, wire mesh, cardboard, textiles, charcoal, and even the fins of fish. While the exact medium of Poem “Winter” is unknown, scholars of Onchi’s work speculate that charcoal, among other materials, was used to create an effect of ambiguity. This abstract print was likely part of a series called “Poems,” which coupled images with poetry. Onchi was a dedicated poet as well as a printmaker; his verses were often free in form, written in the same elusive style that characterized his enigmatic visual compositions.